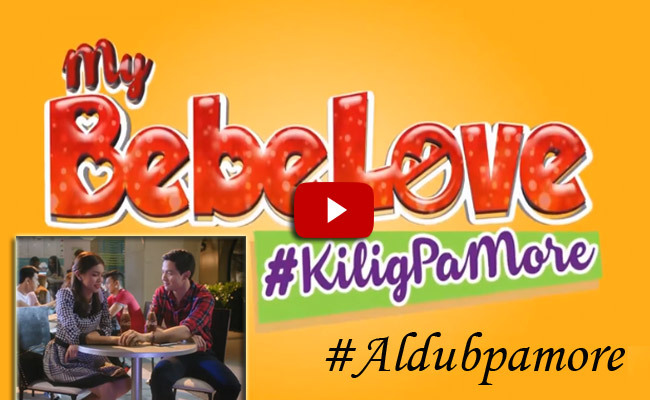 Much to the delight of the AlDub Nation, GMA Films has finally released the full trailer of AlDub’s first movie ‘My Bebe Love: #KiligPaMore’ online. The 2015 Metro Manila Film Festival entry ‘My Bebe Love’ features loveteam Maine ‘Yaya Dub’ Mendoza and Alden Richards together with veteran actor Vic Sotto and comedienne Ai-ai Delas Alas. Richards plays the role of Dondi, an obedient and nerdy type of guy who always lean on the decisions of his aunt played by Ai-ai delas Alas. On the other hand, Maine Mendoza characterizes Anna who is the rebellious and stubborn daughter of Vito Carillo (Vic Sotto). The trailer shows the conflict between the families of Dindo and Anna, much like the classic Romeo and Juliet. Yet, despite the conflict and their contrasting personalities, the two got to know each other and started to fall in love. Anna’s father and Dindo’s aunt won’t let the two end up together, so they teamed up and tried to make them separate. The film started out with the fans requesting for the love team to have a movie. Soon social media posts hinted that a movie was being planned with a working title ‘ Rom-comin Mo Ako.’ It was confirmed that Vic Sotto and Ai-ai Delas Alas will be starring in the film, yet the involvement of AlDub was unclear. After a few months of speculations, the long wait of fans has ended as it was confirmed that AlDub will also star in the movie. The film written and directed by Jose Javier Reyes also included and considered the fan’s suggestions on the storyline. The shoot started on September 19, 2015, but the love team’s TV show was also put into consideration. Joining the main casts are Arlene Mulach, Ryan Yllana, Vallen Montenegro and Sacho Vito delas Alas.